My life tends to be ruled by lists, lists of my own making, I should add, but lists none the less. I realized I had a whole lotta little things to tell you about and I could make a list; certainly not a new thing to the blogging world, but definitely a new blogging tool for me! 1. It's my birthday this weekend, gearing up for a fun eve with friends at our new wine bar, Corks and More... it's got self-serve wine machines, which once you get over the weirdness of self-serving your own wine tasting, it's rather fun! 2. The new Knitty is out, I am in love with many of the designs, but have to say, I COVET THIS for my spring wardrobe. 3. Last week the weather finally warmed up and I got to dust off my road bike and learn how to use the clipless shoes and pedals my dear friend got me last year for my birthday. After reading this I rode around the lawn for a bit. It was amusing, I'm glad there wasn't a hidden camera! Once I got the hang of it I had an incredible ride to work and back, so much easier to summit the hills. 4. 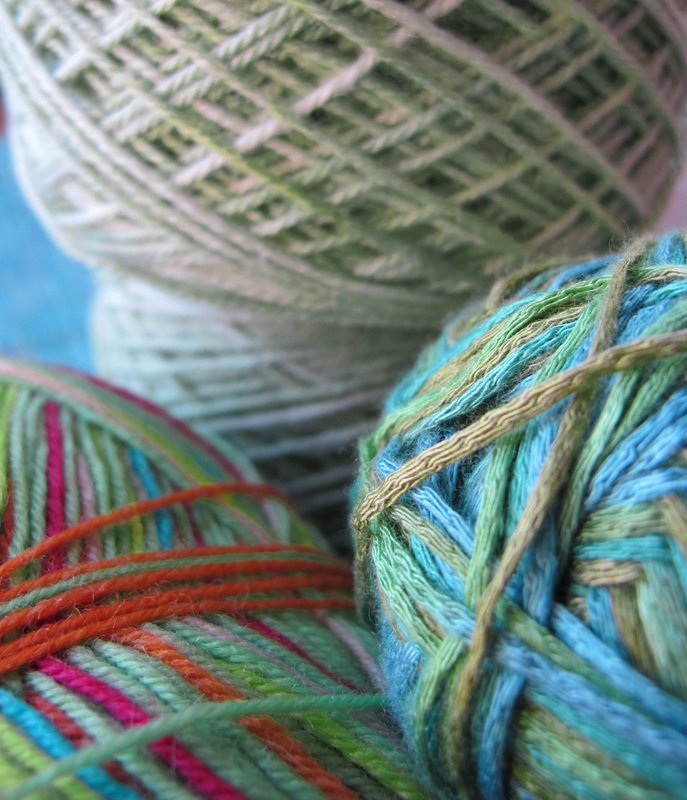 I have been surrounding myself with the color green.. just look at the pile of yarn I've been playing with lately, see a trend? Guess I have a one track mind about spring! 5. We are gearing up for a 3 week road trip in our VW van to Utah, Arizona and New Mexico. Thinking we all need water bottle holders for the desert, I going to make one of these and one of these next chance I get. 6. In my endless effort to attempt to learn to be a better writer, I think I need this poster in my office. 7. My classes at SQUAM are filling up, if you are considering going, YOU SHOULD! 8. Have you seen Rosemary Hill's Brandywine Shawl? Romi is donating $5 of the purchase price to Doctors without Borders. Her goal is to sell 10,000 patterns for the people of Haiti. Romi has sold 1,600 last I checked, which means $8000 has already been donated, isn't that amazing? I LOVE knitters! Go Romi Go! 9. I like love these shoes... I think I have to have them (even though they ship from Uruguay)... thanks for enabling my shoe fetish Maya! 10. And finally, thanks for all the Snuggler love I got here and on Ravelry... right back atcha! OMG!!! Those shoes are fab! I will absolutely be ordering a pair. My dear friend just sent me a gift certificate for them... guess what I'll be ordering this weekend?? ?